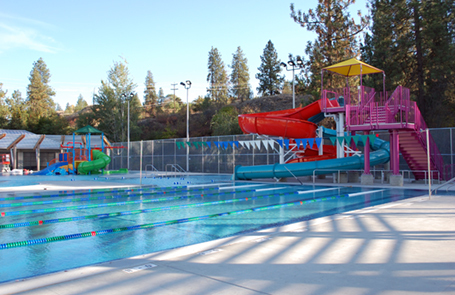 In early 2007, the City of Spokane, Washington, retained the team of Counsilman-Hunsaker and ALSC Architects to prepare construction documents for the replacement of obsolete aquatic centers at six municipal regional parks. Following an aggressive schedule of public meetings, the southeastern community (deeply involved throughout the process) had their say in the eventual outcome of new design options for the Liberty Pool located in Liberty Park. At this site, the design team’s greatest challenge (set forth by the city) was to stretch the allotted budget in order to maximize the water area and aquatic related amenities. The final outcome re-used as much of the existing building by upgrading the bathhouse amenities and re-planning the mechanical equipment space to house the new heater, filtrations; and additional new pumps required for new waterslides, play structure, and vortex.